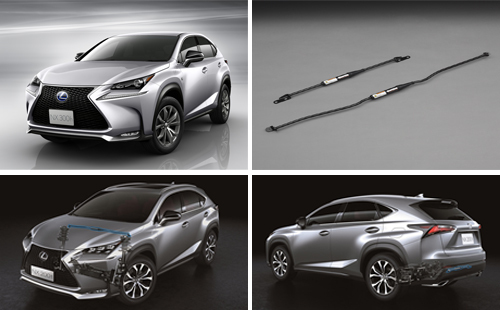 Yamaha Motor's Performance Damper Features in LEXUS NX Fourth LEXUS model to implement the system - News Releases | Yamaha Motor Co., Ltd.
IWATA, July 30, 2014 - Yamaha Motor Co., Ltd. (Tokyo:7272) will supply its unique chassis damping component – the Performance Damper – for use in the new LEXUS NX (F SPORT) released on July 29. This is the first compact crossover SUV by LEXUS. The NX is the fourth LEXUS model to be fitted with Yamaha Motor's Performance Damper following its successful implementation in the LEXUS CT200h (Version L/C, F SPORT), RX450h/350 (F SPORT) and HS250h. The Performance Damper is a chassis damping component that is set in the structural areas of both the front and rear of vehicles. It is a device that controls and absorbs minute distortions and vibrations. The Performance Damper was first used in a mass-production model in April 2004, four years on from its basic concept development in 2000. Since then, the Performance Damper has been contributing to improvements in stability, comfort and agility in a wide variety of vehicle types. When the chassis is in motion, it limits dynamic distortion to just a few microns. A metal vehicle body has elastic characteristics and lacks damping force, meaning that external distortion energy is accumulated and released almost unchanged, repeating the cycle of distortion at a natural frequency. The Performance Damper adds a damping element to the chassis that absorbs distortion energy and releases it as heat. This curbs the chassis's excessive distortion speed, not only boosting driving comfort at normal speeds, but also achieving both high mobility and excellent stability at high speeds, which are accompanied by relatively major chassis distortion.